You are in the midst of a kitchen renovation, and it is now time to choose between a granite or quartz countertop. You find yourself stuck and unsure about which to choose. To help with your decision, here is a quick rundown of the pros and cons of each type. Granite countertops offer a unique look and style for your kitchen remodel because they are 100 percent natural stone which means no two slabs are identical. With that being said, there are also hundreds of colors to choose from, and with the larger slabs, you won’t even have to worry about a seam showing through. Professionally installed granite countertops are also stain resistant and can stand up to normal kitchen wear and tear while still looking good. The stone will not weather or fade and will not soak up any liquids that could damage the surface. 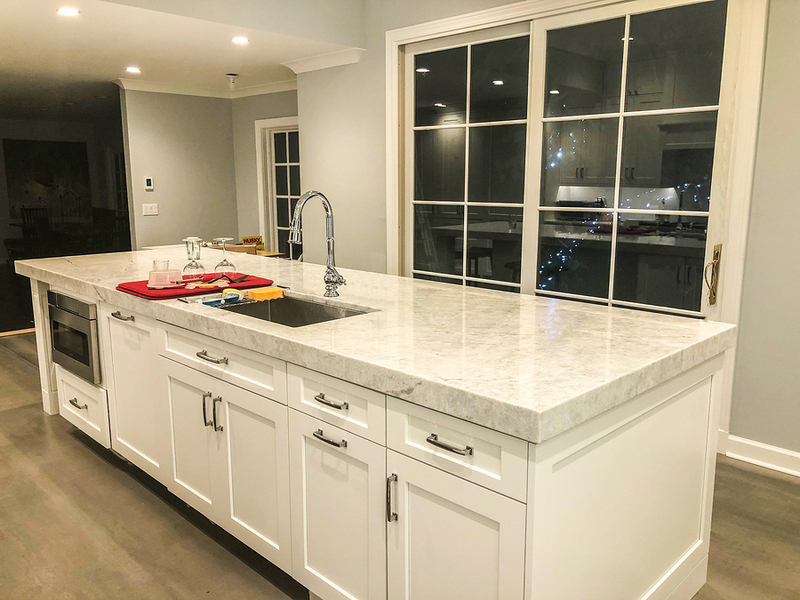 However, granite is still an absorbent material, so if they are not installed and sealed properly by professionals, then you will find that the granite will begin to soak up liquids and oils and it will also hold bacteria. You will also find that with the many variations between each slab, you might find it difficult to find enough that matches. If you are not a fan of the color or texture variation that is common when choosing granite, then you should opt for a different countertop material. Quartz is a mineral, and these types of countertops are human-made. With a variety of colors and patterns to choose from, you are not limited by design. You will have access to many options including different colors and textures to fit any style or taste. Finished quartz also offers a very rich look and is more flexible than granite. However, you may have a problem hiding the seams unless you choose a darker quartz variety. This option is also naturally less beautiful than granite. Cambria, however, does the best job when it comes to providing you with a more natural looking stone for your kitchen. If you are interested and want to take a look at the Cambria countertops, contact us at Cardigan today.